Please refer to our stock # 1726/4465 when inquiring. A Chinese silver bowl embossed with a continuous decoration of chrysanthemums around the body. It stands on a slightly splayed circular foot and the rim is reeded.Stamped with the maker's name YOK SANG as well as Chinese characters, it is an arresting and beautiful example of Export silver in very good condition with no repairs . 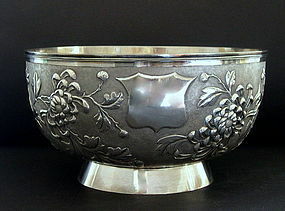 size: 8 1/4inches (21 cm) diameter of the bowl x 5 3/4 inches (15 cm) high. age: C. 1890. good heavy gauge. weight; 558 grams ( 18 oz).